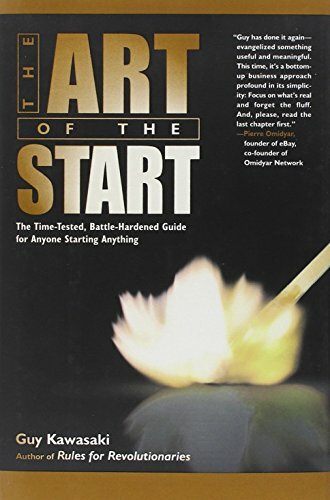 I’ve just finished reading Guy Kawasaki’s The Art of the Start and I must say I’m quite impressed. For the last two years I’ve been working for at a start-up on an interesting product. We’ve got the core of our ‘magic sauce’ working just great but now I’m relying on business people to make it happen and I should probably have some idea of what that involves and how I can help. This is where Kawasaki’s book steps in and whilst seemingly-short packs in lots of useful and practical information on developing your product, team and company from scratch. As Guy is now running a venture capitalist company and was there in the early day s of Apple as a software evangelist he certainly has the credentials to be putting it all on the line (or should that be paper) for you to digest and he certainly delivers in clear English what he’s expecting from people approaching his company for funding. Check out Guy Kawasaki’s blog where he puts up additional information, video clips, tips, hints and templates along the same lines as his book.